I was given this back in 2006 after being in storage for several years. It was originally purchased by my brother in law in about 1971 when it would have cost £46.00. 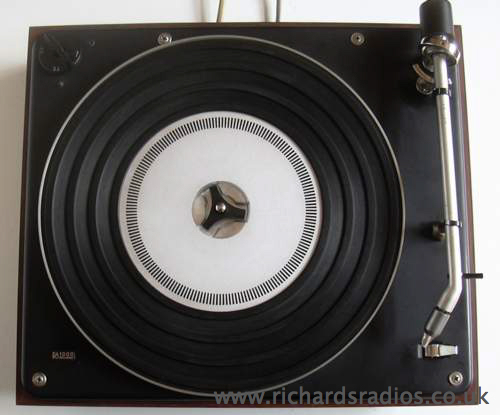 The pictures on the above site suggest that this turntable would be a model 1001 though as can be seen from the markings on the bottom cover this is a Beogram 1000. View of underside Note the plastic wheel which has a cam on its underside which in turn can move the motor rotor up and down.The motor has an additional winding which acts as a transformer providing a 14 Volt supply to power a small four transistor stereo amplifier which can be plugged in to the socket instead of the short circuit plate seen here. The first job was to free the motor and the speed adjustment mechanism which in its years of idleness had seized because the grease had hardened. I evolved the following method to get the mechanism apart and back into working order which I trust might help one or two readers of this page. 1. Secure the pickup arm in the home position by tying it to the support post. 2.pull off the speed selector knob. 3.Replace plastic cover and invert the turntable to expose the base and remove the hardboard cover. 6. clean the drive pulley of rubber residue from the drive belt. 7.Remove the drive wire for the fine speed adjuster and pull back the spring which keeps this shaft in position. 8.The shaft should be free but may need some gentle application of force and lubricant to get it to turn freely. 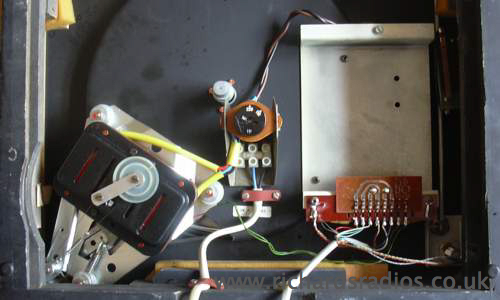 10.Remove the cable clamps, turn the machine over and remove the four screws and cup washers to free the turntable from the wood casing. 11.You will now have access to the drive pulley and the belt which hopefully is encircling the platter and fiddling with a bent piece of wire should enable it to pass round both. Mike Asimov sent me this email comment which details the problems he had. The turntable and pickup are now working well and I now have it connected to a Beomaster 1200 together with a Sanyo CD player.